This post was done in partnership with Sundown at the Grove, who provided me with food and drinks, free of charge. 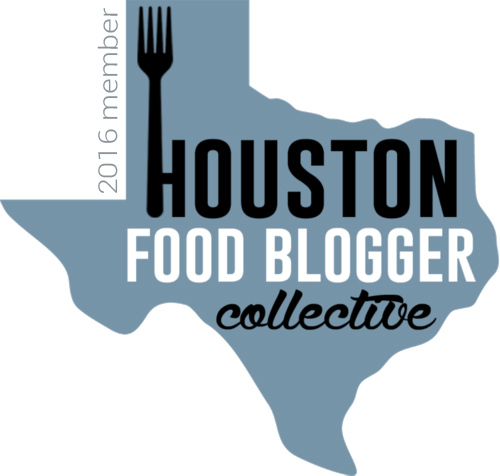 I was not monetarily compensated for writing this Houston event review. All opinions are completely, 100% my own! We are truly in the thick of the dog days of summer here in Houston. But I have a cure for those hot, sweaty, summertime blues! (that is, if you live in Houston, aka the center of the swampy sun right now). And my cure is this: Sundown at The Grove. 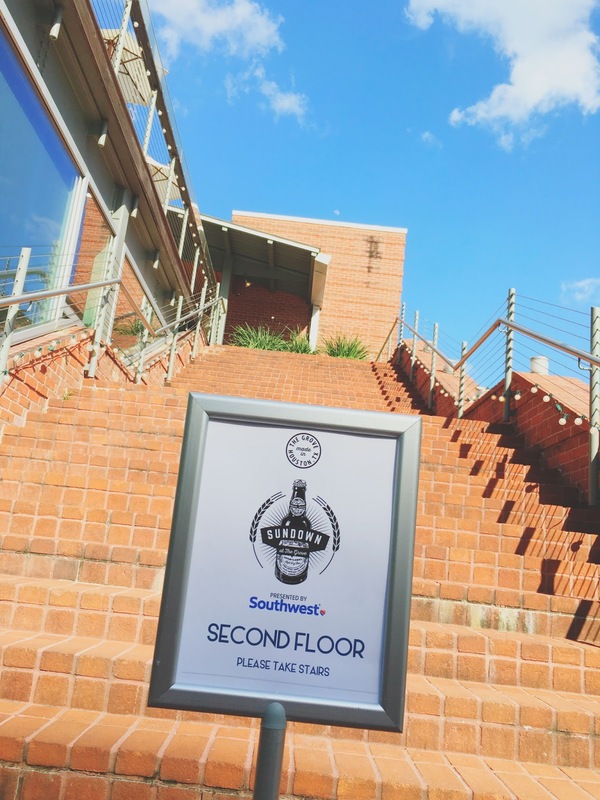 Last week I was invited to attend Sundown at The Grove, an event that takes place on Wednesday nights every summer in the Treehouse space above the restaurant The Grove, located in Houston's Discovery Green park. A $20 ticket grants you a couple of hours in this beautiful setting overlooking the trees and park (and people congregating doing Pokémon Go which sorry if you're a superfan but it kind of weirds me out, but then again I read the whole Twilight series *maybe* more than once so judge away), four courses of light bites paired with beers from the chosen brewery of the day, and tunes cranked out by a DJ! Oh, and you also get to enter to win Southwest Airline tickets, which is never a bad thing. Sundown at the Grove has been on my to-do list the past couple of summers, so I was pumped to finally get to go! I took Jon as my +1, and we were exceptionally grateful upon entering the open, airy, air-conditioned room. We also ran into my Houston blogger friend Erika and got to enjoy our food and drinks with her and her sis. Jon opted for a wine paring instead of a beer pairing (BECAUSE THAT'S AN OPTION), but I stuck with beer since I wanted to report back on it. The featured brewery of the day was Houston's own 8th Wonder, which even though I'm not a huge beer person, I totally dig theirs! 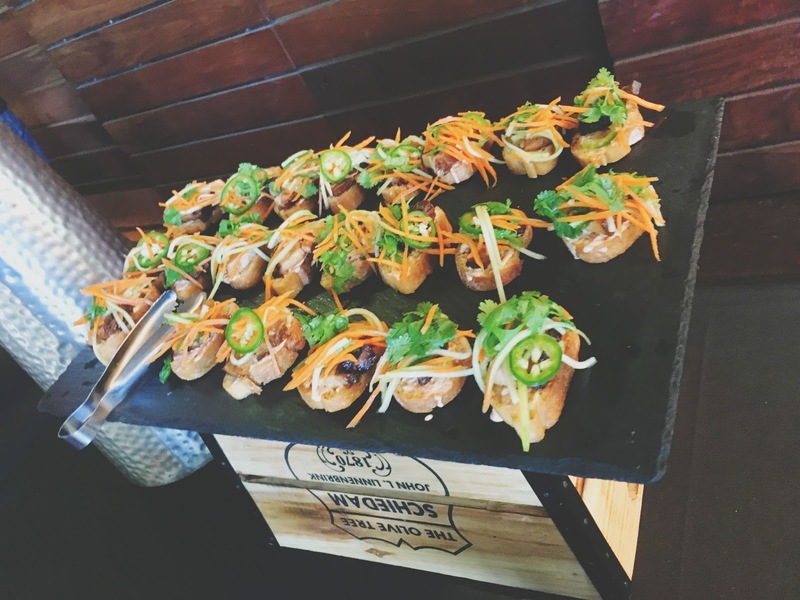 Served buffet style, the first course of food was a mini banh mi, paired with Rocket Fuel. I did not eat the banh mi since it had meat in it, but the Rocket Fuel ended up being my favorite of the four beers! It was dark, chocolate-y, and esspresso-y (excellent descriptors, I know). 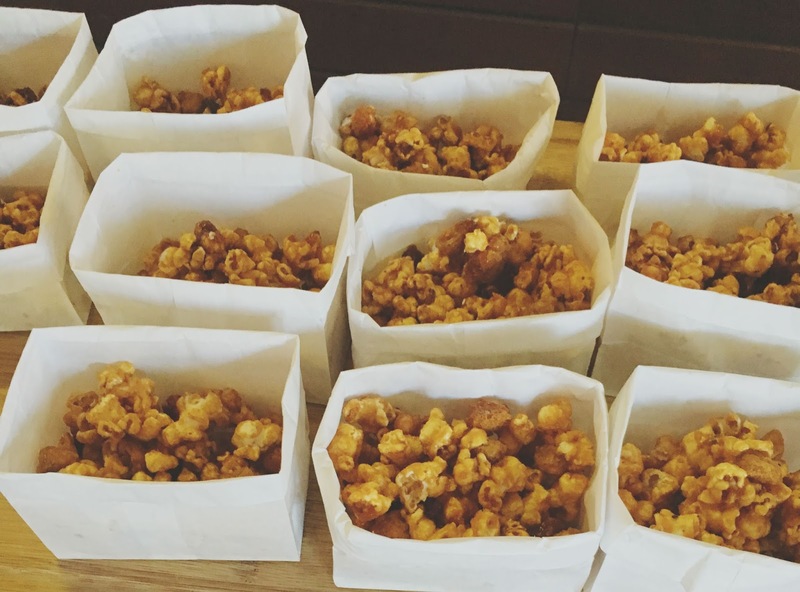 The second food item was my favorite of the evening - the homemade cracker jacks, paired with Dome Feaux'm. These cracker jacks were ADDICTING. They were only slightly crunchy, so they didn't hurt your teeth, were LOADED with caramel, and absolutely outstanding. I seriously lost my mind over these! 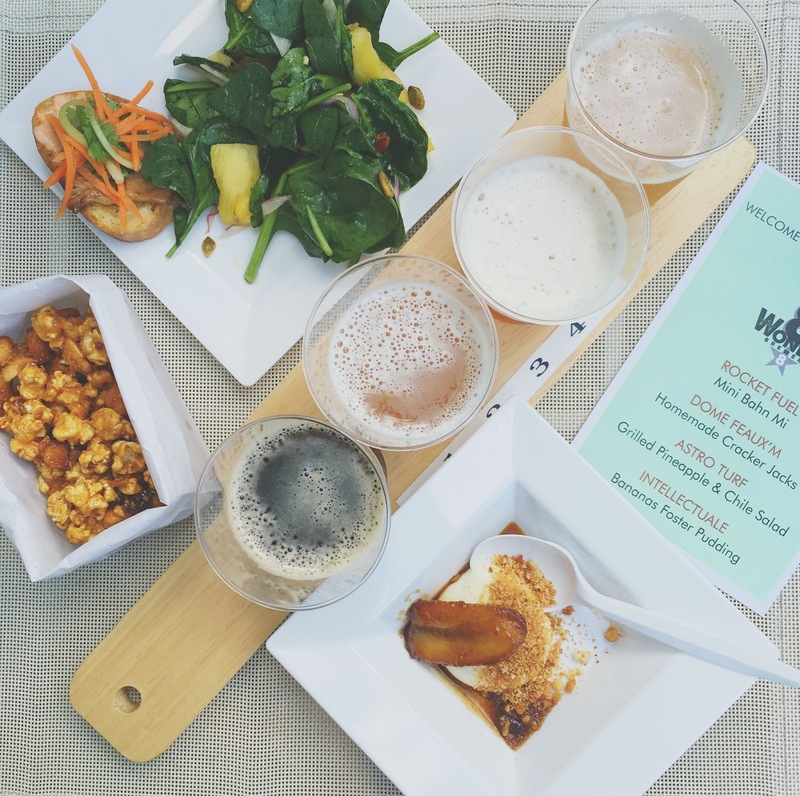 I'm no beer aficionado, so moving forward, just know that all of the beers were insanely refreshing, delicious, and paired perfectly with the foods! The third round of food was a grilled pineapple and chili salad, paired with Astro Turf. This nice light, citrusy salad had a little bite from some red onions, and some texture from pumpkin seeds (I believe). It was the perfect salad for a "my legs won't stop sticking together" kind of summer day! The last round of food was a bananas foster pudding, paired with Intellectuale. Before my heat-fried brain could register the idea that the pudding probably had gelatin in it, I was a bad vegetarian and took a bite. And I'm not gonna lie, it was pretty darn magical. 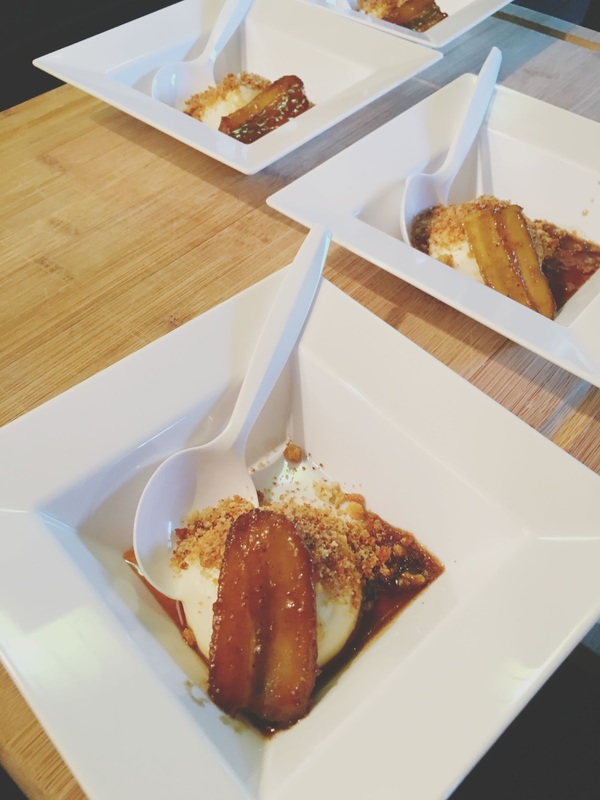 The pudding was smooth and playful, the banana was beautifully cooked, and the caramel drizzle looped everything back to the cracker jacks. I only had one bite because my brain finally caught up to me, but I can attest that this was an outstanding dessert! And the Intellectuale was my second favorite of the beers - It was light, lemony, and refreshing! 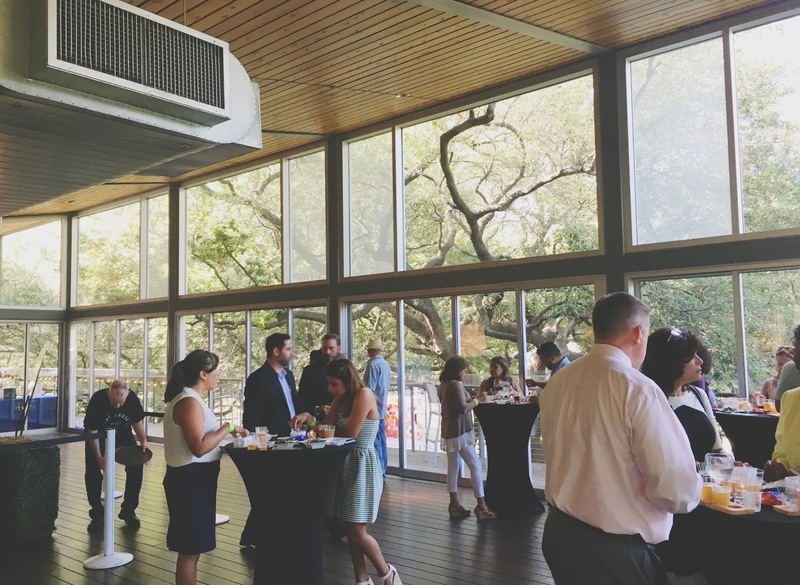 Sundown at The Grove is a fantastic summertime Houston food and drink event. It attracts an after-work crowd, filled with people seeking refuge from the heat and celebrating making it mid-way through the week. The mood is laid back and fun, and the food and drinks are great!